Eating healthy isn’t so painful when you’re a food nerd. Well, it is, because there are so many unhealthy things I could make if I wanted, but I choose to focus my food nerd energies towards making healthy stuff like this dinner I had tonight. I’m on the eat generally good stuff, and not too much of it, diet. I make lots of stuff in big batches to combine into meals later, and also keep lots of produce in my fridge at all times. 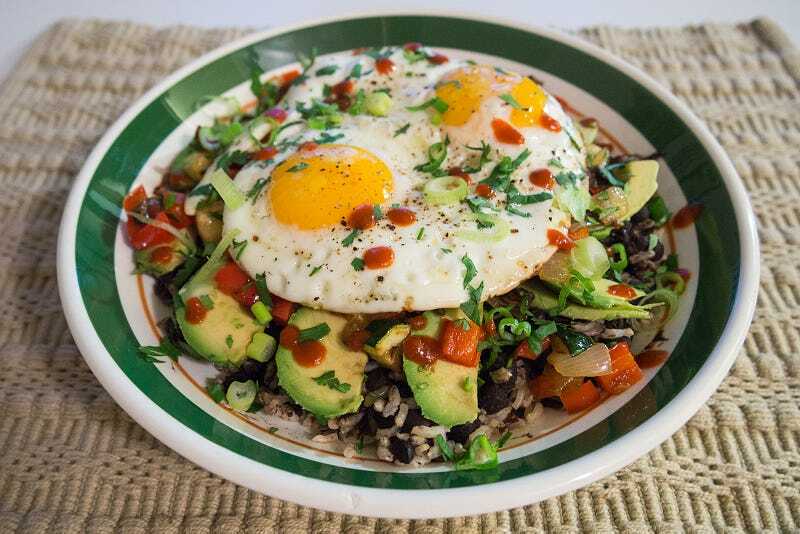 This bowl is brown/wild rice medley with black beans that I made from scratch earlier this week and warmed back up, sauteed veggies (red pepper, onion, zucchini, portobello mushrooms), half an avocado, a couple sunny-side eggs, and finished with cilantro, green onions, and sriracha. I bet my farts will be amazing tomorrow.